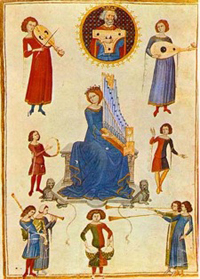 Boethius, De Musica, from Naples, Biblioteca Nazionale Vittorio Emanuele III, MS V. A. 14. The MAA is delighted to supplement the impressive roster of awards garnered by MAA members during the past fellowship season (already listed in previous editions of the MAA News) with several more late-breaking announcements. The Fulbright Commission announced that Zrinka Stahuljak, Associate Professor at UCLA, has been named a Research Scholar in France at the L’École des hautes études en sciences sociales (EHESS). The Committee for Professional Development has awarded an MAA Travel Grant for 2012 to Lyle Humphrey from NYU to travel to the St. Louis Conference on Manuscript Studies in October. The Committee for Professional Development included Andrew Taylor (Chair, University of Ottawa), Bruce O’Brien (University of Mary Washington), and Karen Mathews (University of Miami). Cecily Hilsdale, Byzantine Art and Diplomacy in an Age of Decline, Cambridge University Press, Michael Sharp, editor. Nicholas Paul, To Follow in Their Footsteps: The Crusades and Family Memory in the High Middle Ages, Cornell University Press, Peter Potter, editor. The Board included: Michael Kulikowski (Chair, Pennsylvania State University), Warren Brown (California Institute of Technology), Wendy Pfeffer (University of Louisville), Paul M. Cobb (University of Pennsylvania), Adam Kosto (Columbia University), and Ronald G. Musto (Medieval Academy).